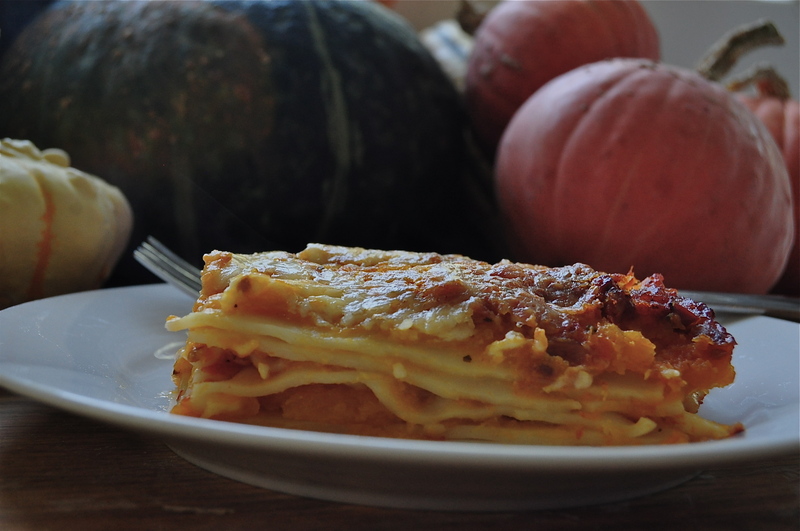 This easy vegetarian lasagna is great for holiday meals. Add a salad and some fresh baked bread and you’re done. It appears as though there are a lot of steps, but you can either cheat and use store bought or prepare the layers ahead of time. 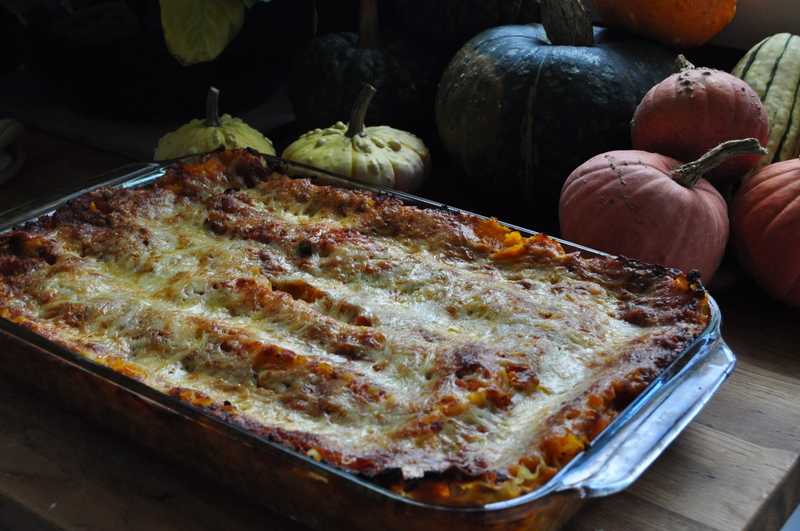 As I had some homemade pumpkin puree and a jar of my canned spaghetti sauce on hand, I only needed to make the bechamel sauce and grate some cheese. Easy peasy. To roast your own pumpkin puree, slice your pumpkin (make sure you buy a baking pumpkin, NOT the kind you carve 😉 sugar pumpkins are my favorite) in half. Place cut side up on a baking sheet. Don’t worry about removing the seeds, it’s easier to do it after roasting. Roast at 400• for around 40-60 minutes depending on the size of your pumpkin. Check to see if it’s done by poking it with a fork. If it’s soft, it’s done. Remove from the oven and use a spoon to scoop the “guts” out. Scoop the rest of the pumpkin out and mash until smooth. This can be frozen or stored in the fridge for a couple of days. I use coconut milk to make my bechamel sauce in an attempt to reduce the hit of dairy in this recipe. Once simmered with the savoury ingredients you cannot taste the coconut at all and the sauce is indistinguishable from the milk version. Trust me. – 3 (or more) cups of cheese, grated. I use mozzarella, havarti, cheddar, fontina or a mixture. Heat butter and flour together over medium heat. Stir constantly until mixture begins to brown. Once butter and flour reach a golden brown, pour in coconut milk. Increase heat to medium high and add onions and garlic. Whisk. Just before mixture reaches a boil, reduce heat to low and add the sage. Allow to simmer on low heat about 10 minutes, until thick enough to coat the back of a spoon. Remove from heat. Strain, discarding the solids. Add parmesan cheese. Taste. Season with salt and pepper until perfect. Preheat oven to 400•. Cook lasagna noodles according to package directions. Drain and rinse with cold water to stop the cooking process. Layer a small amount of marinara sauce, followed by a small amount of bechamel sauce in the bottom of a 9×13 lasagna pan. Place your first layer of noodles. 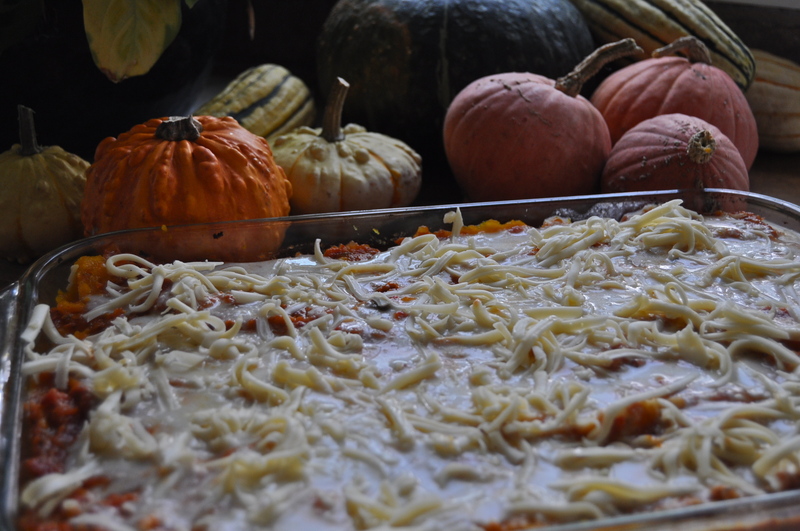 Spread approximately 1/5th of the pumpkin puree over layers. If you are using the basil, tear a layer over the pumpkin. Add a layer (approximately 1/5th) of marinara sauce, a layer (approximately 1/5th) of bechamel sauce and a sprinkling of cheese. I usually only add a little bit of cheese between the layers and save most for the top. It gets lost in the layers, but provides a nice browned crust for the top. Continue forming the layers until all of the ingredients are used up. Don’t stress about making each layer perfect, just keep going until you are about 1 inch from the top of the pan. Place in the oven and bake for 45-55 minutes until the top is bubbling and beginning to brown in spots. Remove from heat and allow to cool for at least 10 minutes before slicing. This entry was posted in Uncategorized and tagged best, easy, fall, healthy, how to make pumpkin puree, how to roast pumpkin, lasagna, pumpkin, recipe, vegetarian. Bookmark the permalink.